Kenya Safari Bookings driver and staff will pick you from your hotel or place of stay and after abrief stop-over at our offices, for briefing purposes, depart for a journey south along the floor of the Great Rift Valley with a pit stop at the View Point for breath taking view of the rift valley. You can take photos and buy souvenirs as you listen to African tales about the formation of the rift valley. Arrive at Masai Mara in the late afternoon and enjoy a game drive till twilight. 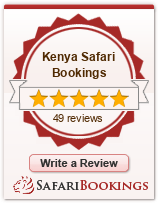 On this full kenya safari bookings safari we spent it viewing animals cross the rich, treestudded grassland and rolling hills. The famous mara is renowned for its great herds of plain game, black-maned lions, leopard and cheetah but also contains numerous elephant and virtually every type of wildlife to be found in Kenya. Pre-breakfast morning game drive. After breakfast, proceed to lake naivasha for boat ride then afterwards you drive to Lake Nakuru, which is often referred to as the pink lake for it’s great masses of pink flamingos and the home of the white and black rhinos and about 350 different species of birds; the Ornithological Paradise. After breakfast proceed for morning game drive to Lake Nakuru which is world renowned for its masses of flamingoes and is often referred to as the "Pink Lake". Beside birds, it is possible to see small game, like Water Buck, Impala, Rhino and Buffalo in the gardens surrounding. After lunch depart to Nairobi arriving around 4/5pm in the evening.